December 22, 2016 July 24, 2018 - by admin - 3 Comments. “Ok so this happened to my friend and I around 2005 I was 20 years old. We had a couple of beers each earlier in the night so pretty much sober. We were driving on highway 59 right outside of Houston near an area called kingwood. This is the first time I have tried to write the experience down so bear with me and feel free to ask me any questions or details if you’d like. So it was about 3:00am and he was driving I was in the passenger seat. 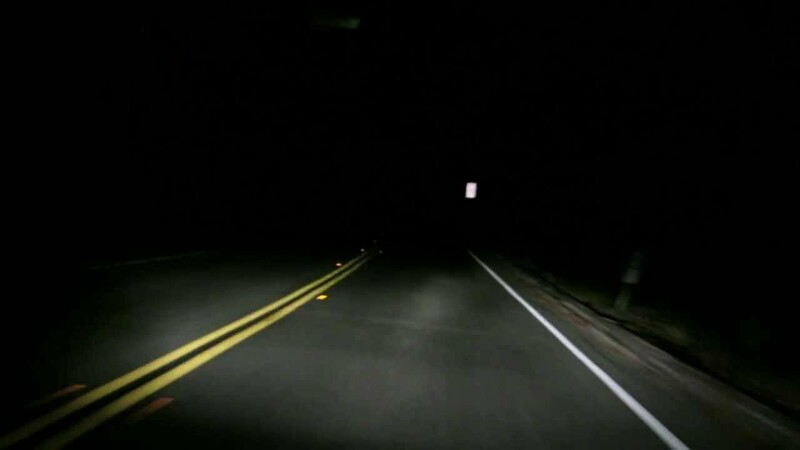 It was a large 3 lane highway and was illuminated quite well with those ‘orange’ colored street lights. In the distance we noticed something in the middle of the freeway, it looked to me like a man on crutches and my immediate thought was that it was a bum or something. But when we got closer it was apparent that it was without a doubt not human. Now here is where I will describe in the most detail I can what I saw: What I thought were crutches were actually its arms but they extended well above its head. Large fleshy poles is what it looked like, very knobbed and non uniform. It did not have legs but rather some type of abdomen or nub from what I could tell from behind. Its head was very shocking, it looked like a bulbous mass like a giant water balloon slopped to one side, very large. The whole thing was a rust like color I am not sure if this was its actual color because it was also the color of the street lamps. I would say a good 7 or 8 feet tall. At this point we are completely freaking out he’s screaming and I am yelling every obscenity I know. He pulls into the left lane so as not to hit it and, me being in the passenger seat got an up close and personal look at the thing. 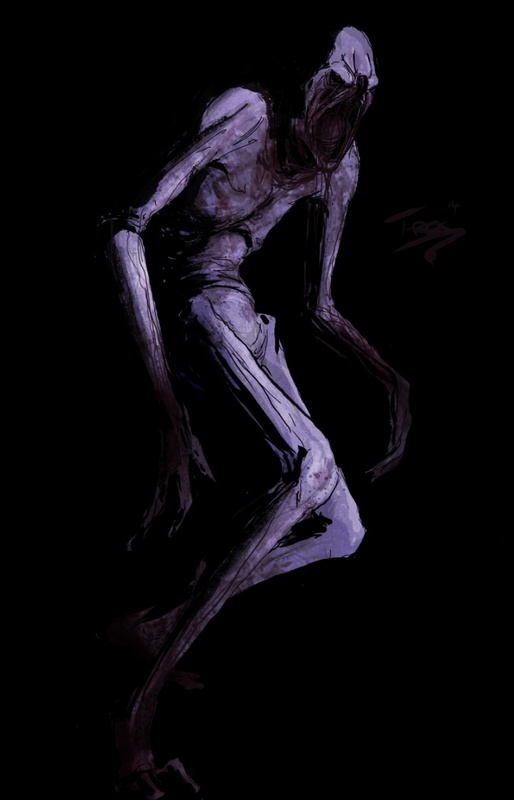 Its body seemed wrapped in what I would call ‘mummy-like wrappings’ but embedded and haphazardly put on, mostly around the abdomen nub area. But the face was the most shocking part. There wasnt really a face there, just folds of skin this may sound gross or crass but I don’t really know how else to describe it, it looked vaginal and disgusting. It should also be noted that it payed absolutely no attention to us. Also the thing was propelling itself with those pole/arms and using its abdomen thing as leverage or something, kind of difficult to explain but I could try again if anyone is wondering. It was also going at a very fast speed when our vehicle moved past the thing it wasn’t like someone running but maybe like a car going a little under the speed limit. After we passed I looked at him and asked if we should turn back and he said no fing way. So the car ride home was silence punctuated with ‘What the F’ every few minutes. The next day we got together and talked about it and tried to explain to our other friends what we had seen. And every time we see each other even after many years we always bring it up to each other. Now I have no possible explanation for what this thing was. I have searched many times online typing in every description I have and I always come up with nothing. I even thought about calling into one of those late night radio shows but I am too shy for that. The main reason I am writing this is because I still desperately want to know what this thing was and I wonder if anyone has ever seen anything similar. If you guys could point me in a direction to someone who could be of any help to me I would be very appreciative. Have you been back to the location since ? I live in the humble area and would love to check it out but don’t really expect to see anything, considering it was 11 years ago. I’m researching a cryptid for a blog I made for fun a few days ago, but I think I know what you saw. 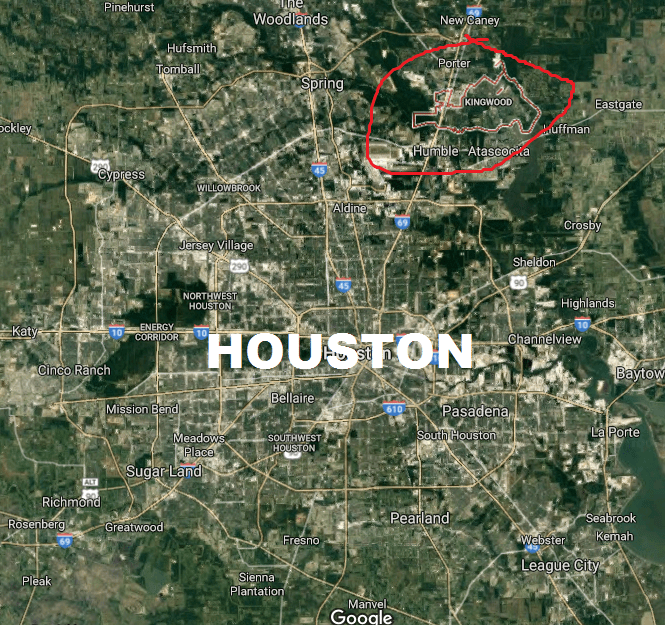 When I used to live in Houston, I hated that there weren’t any cryptids in that area, but then I heard about the Houston Horror. Also known as the Houston Batman. I think you know where I’m getting at. Yea long time ago development was still going on around and in Kingwood at that time.who knows,maybe something out and about lost and looking for a snack!!! I have seen a few very strange things in my life…where about did you see this,closest exit etc.? Wondering what was around at that time? Woods,stores,etc. I have heard of “things” living underground. I would have been the one to coast next to it….